This tutorial explains how to find confidence intervals in R for means and proportions. where x is the sample mean, tn-1 is the t critical-value that comes from the t distribution table with n-1 degrees of freedom, s is the sample standard deviation, and n is the sample size. The following example illustrates how to find a confidence interval for a mean in R.
Use this sample to construct a 95% confidence interval for the mean height of tomato plants in this region. The 95% confidence interval for the mean height (in inches) of tomato plants in this region is (14.45895, 17.54105). where x1 is the mean of sample 1, x2 is the mean of sample 2, s21 is the variance of sample 1, n1 is the sample size of sample 1, s22 is the variance of sample 2, and n2 is the sample size of sample 2. The following example illustrates how to find a confidence interval for the difference between two population means in R.
Researchers want to know whether a new diet helps people lose weight. 100 randomly assigned people are assigned to group 1 and put on the new diet. Another 100 randomly assigned people are assigned to group 2 and are kept on their normal diet. After three months, the mean weight loss for group 1 was 8 pounds with a standard deviation of 2 pounds and the mean weight loss for group 2 was 6 pounds with a standard deviation of 3 pounds. 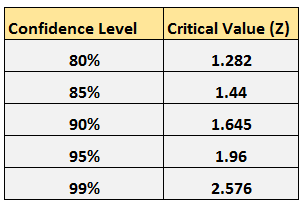 Construct a 90% confidence interval for the difference in mean weight loss of group 1 – group 2. The 90% confidence interval for the difference in mean weight loss (in lbs) of group 1 – group 2 is (1.40694, 2.59306). where p is the sample proportion and n is the sample size. The following example illustrates how to find a confidence interval for a population proportion in R.
There are 500 students at a certain school. The principal of the school wants to estimate what proportion of all students prefer chocolate milk over regular milk in the cafeteria. He takes a simple random sample of 50 students and finds that 20 of the students prefer chocolate milk. Based on this sample, find a 99% confidence interval for the proportion of students at this school who prefer chocolate milk over regular milk. The 99% confidence interval for the proportion of students at this school who prefer chocolate milk over regular milk is (.2215, .5784). where p1 is the proportion of sample 1, p2 is the proportion of sample 2, n1 is the sample size of sample 1, and n2 is the sample size of sample 2. The following example illustrates how to find a confidence interval for the difference between two population proportions in R.
A researcher wants to know what percentage of students at two different universities study for more than one hour per night. He takes a simple random sample of 100 students from each school and finds that 40% of students at school 1 study for more than one hour per night and 35% of students at school 2 study for more than one hour per night. Construct a 95% confidence interval for the difference between the proportion of students who study for more than one hour per night at these two universities. The 95% confidence interval for the difference between the proportion of students who study for more than one hour per night at these two universities is (-.084, .184).